Make your life more fun! Plan your journey easily and quickly. Park at home and travel to the final destination as you wish - in the air or on the road. You can ride the road or fly conveniently and safely. Traffic jams are not your problem anymore - just overfly them! Enjoy the beautiful landscape around you during your flight. You can fly fast or slowdown above places catching your eyes. Get your pilot and driving license in the specialized school FLYWAY. No chance to fly? Keep calm - just ride. You will definitely attract attention on the road with GyroMotion. Refuel and take off again! If you want to get the GyroMotion license - use an ideal offer by MyFirstFly. Enjoy your travels with no limits! Would you like to visit long distance places but you know it takes long hours? GyroMotion offers an ideal flight to the chosen destination. Another option is to cross the border on the road and take off with unlimited possibilities. Reach the nearest runway, accelerate your ride as well as a plane and take-off. You will land like a helicopter and landing distance up to 40 metress is enough. 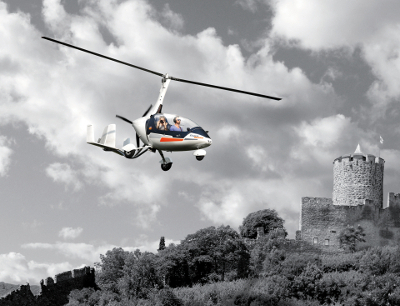 Gyroplane with GyroMotion is not a flying car – it is a riding flying machine. Modern technology of a transmission of a driving forces, that is placed into construction of the wheel, that provides travelling on the road up to 40km/h. Conversion from driving mode to flight emergency takes no longer than 5 minutes. As well as all similar aircraft machines, the gyroplane is not controlled through the steering wheel. In the air it´s logical, but on the road you will experience so much fun. 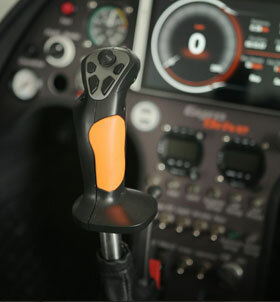 The required flight controls include yoke and embedded devices are already in the gyroplane before the installation of the GyroMotion technology . Pilot Interface and hardware interface hidden in the driver´s seat area allow great operation on the road. You will cause a stir at any gas station with the GyroMotion. No other difficulties anymore, ranging up home with GyroMotion will be always possible. Usual Natural 95 is sufficient for driving and flying as well. A wide network of gas stations allow refuelling with the same comfort as with a car. The gyroplane with the GyroMotion is the only machine in the world that can be refueled where other aviators can not go. Maximum comfort and air parameters of the AutoGyro gyroplane with value-added technologies and design elements as the GyroMotion will amaze experts and laymen as well. Air speed up to 185 km/h, the ability to almost fly at 30 km/h, zero risk of falling due to autorotation and range limited only by the size of the fuel tank. Custumized design and original the GyroMotion features create an irresistible combination. You will be the first one in the world, who is going to be admired, wherever you are. You can go anywhere you want – for example: fly to the spa, stop at a café for a break, or during your visit of your favourite castle – anywhere you go, you can be there fast and safe. If you already own the Autogyro gyroplane or if you are thinking about purchasing one, you can enjoy amazing experience on the road or in the air as well. Gyroplanes are, in fact, alive and flourishing, so do not hesitate to enter into new era of combined mobility with us. ARE THE WAY THEY ARE! GyroMotion is a great technological solution for an electric motor drive of a gyroplane including main engine connected with the main rotor for air operation and with the secondary engine for operation on the road. 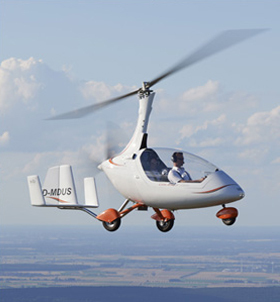 The gyroplane GyroMotion is equipped with safety features like special headlights, a removable licence plate, a warning triangle, a rotor fixation and a wireless control unit. This gyroplane has been designed and tested to transport two persons and it is powered by a combustion engine and a turboprop. The gyroplane is equipped with a rotor and uses a pusher propeller for forward thrust. The rotating wings of a helicopter (the "rotor") are driven directly by an engine. Those rotors move great masses of air downward, allowing a helicopter to hover, and those same blades also create forward thrust. The rotating wings of the gyroplane, however, are free spinning and aren't connected to the engine. They provide lift as they spin freely through the air, like those little propellers you get at the fair with a dowel through them that you spin in the palms of your hand, and they fly up and away. Not having engine-driven rotors means gyroplanes can't hover. Also, gyroplanes are true STOL (short takeoff and landing) aircraft that can land in 50-100 feet (remember, they don't hover or take off vertically like helicopters). Gyroplanes have very high wing loading because their rotor blades have little total area, relying on rotational speed, rather than size, to generate lift. This gives them exceptional utility for a variety of tasks. A gyroplane flies in permanent autorotation. That virtue makes gyroplanes extraordinarily safe. The GyroMotion system is activated for operation on the road, when the disconnected pusher propeller that is marked with the warning triangle, is not dangerous at all and motion forward and backward is made by electric motor placed in the construction of the wheel. The range capacity for electric motor is secured by optional recharging is managed by the main engine. For easy and comfortable operation and simple maintenance of the electric motor system, you will find the electric motor placed in the construction of the wheel. The technology is safely stored in the housing of the running wheel fender. 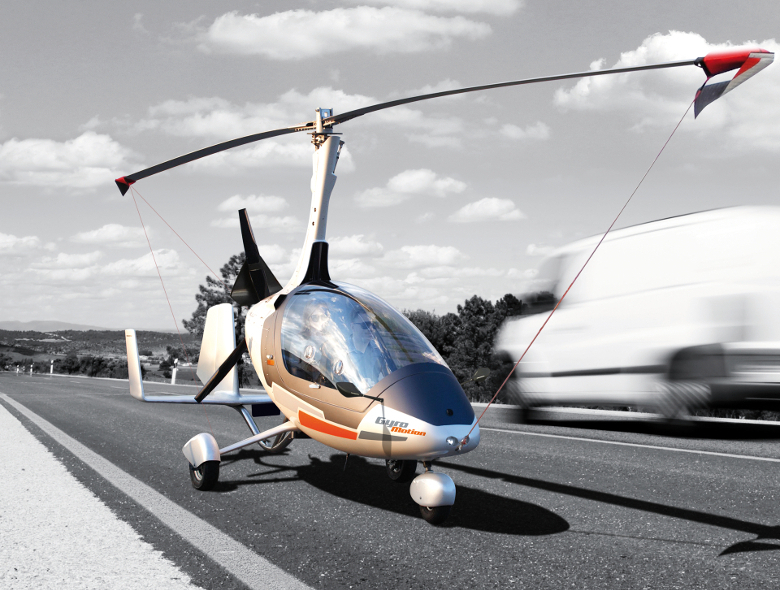 GyroMotion is a homologated technology for gyroplane driving on the road due to traffic rules up to maximum speed 40 km/h. START TO FLY AND DRIVE WITH US! Purchasing of the gyroplane with the GyroMotion technology is not a last step at all. For the safe and efficient operation of the gyroplane, being furnished with the competent certification authority is required and the course the FlyWay is perfect for beginners. Specialized gyroplane school the FlyWay was founded thanks to passion for flying a gyroplane and newly offers experience with the GyroMotion implementation into gyroplanes by the German supplier the AutoGyro Cavalon and Calidus. Customer, who expects more sport experiences or adventure, could fulfill his life with completely new things, that enhance his professional and private life. 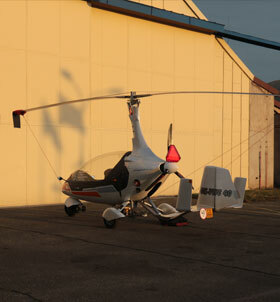 Safety and luxury, that gyroplane with the GyroMotion technology provides, could bring added value to your personality. With gyroplane license your journey is not finished. There is next step for you - let's learn to drive the gyroplane on the road! Newly we offer to share the experience with the implementation of GyroMotion technology to gyroplanes of German supplier Autogyro Cavalon (seats next to each other) and Calidus (seats in a row). 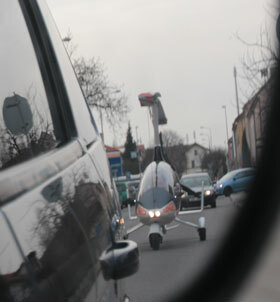 The pilot of the homologated gyroplane able to operate on the road, went for a coffee to Prague. Electro motor drive should simplify transfers from the airport, for example because of need to refuel or parking. 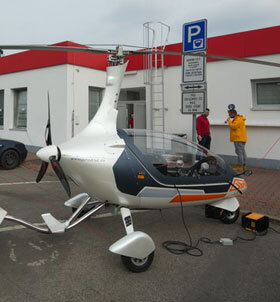 The „flying car“ is going to be introduced in air exhibition at the beginning of April in German Friedrichshafen. Czech manufacturer of the GyroMotion technology for gyroplanes is going to introduce the machine able to fly in the air and operate on the road in AERO FRIEDRICHSHAFEN 2017 exhibiton. Aircraft mobile on the road? Reality in a few weeks. Have you seen the flying Citroen in Fantomas movie? Now I am talking to my generation than to young people, who wouldn´t take this movie seriously in comparsion with modern films with special effects. However, in this series is an element that is the dream of several generations - a flying car.